Chebet was the runaway winner of the Kenyan U20 title earlier this year but she hadn’t distinguished herself in her two prior international appearances. She just missed out on a medal in the 3000m at the IAAF World U18 Championships on home soil in Nairobi last year and she was a distant 10th at the African Cross Country Championships in Chlef, Algeria in March. On that occasion, the Ethiopians dominated proceedings with Girmawit Gebregziabher winning both the individual title and leading Ethiopia to the team title. Gebregziabher was in today’s race along with Ejegayehu Taye and they were tasked with maintaining Ethiopia’s storied tradition in the event. The Japanese duo of Tomomi Musembi Takamatsu and Miku Moribayashi made the pace respectable in the early stages but they drifted back into the pack before the 2000-metre checkpoint. Running three abreast at this point, the pace didn’t pick up again until Taye put in a 71.87 lap – the first lap at sub-15-minute pace – through the 4000-metre checkpoint in 12:40.12. 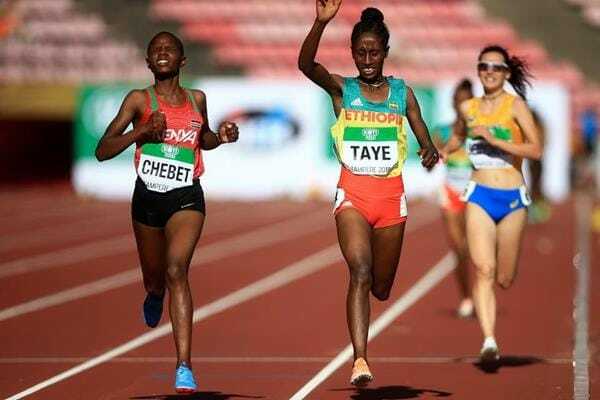 Taye fought Chebet off until the last 150 metres when the 18-year-old moved hard around the outside to assume the lead. Working hard all the way to the finish, Chebet did not allow Taye to get back on level terms with her despite the latter expediently putting out an arm while crossing the finish line. Also making her European debut, Gebregziabher had to settle for bronze in 15:34.01 but has another chance to win her first major track title in tomorrow night’s 3000m final.